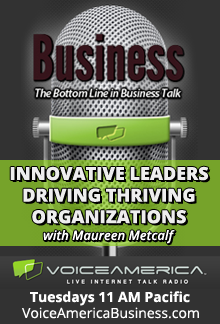 This blog is a companion to the interview with Terri O’Fallon on VoiceAmerica “Innovative Leaders Driving Thriving Organizations” on May 2, 2017, What is A Level 5 / Teal Organization? This post was written by Terri O’Fallon, PhD. The world is a complex place. We are connected and interconnected in ways from which we can no longer retreat with the Internet, and the contemporary ways that make us visible to every pair of eyes that look our way. So, how do we lead in this interconnected atmosphere that is changing so quickly? When we are continually connected to the internet, how can we know that any one fact in the sea of information we are swimming in every day is even true? In today’s climate, much truth can come from within you, the leader, by knowing how to engage with the complex adaptable contexts we live in every day. There are four strategies that support building working environments and systems that can improve a leader’s effectiveness and efficiency as a leader in a complex adaptive team or organization. These four strategies come out of the research from the STAGES developmental model which was derived by integrating developmental approaches related to: 1. our individual beliefs and values, 2. our individual action orientation, 3. the norms and culture of the team or organization and 4. the structural and systemic elements. Using these strategies will not only help leaders achieve their goals, but will make work a pleasure. Support developmental growth of the people in your organization. We grow and develop all our lives. However, growth isn’t like climbing stairs to the top. Developmental maturity is more like blowing up a balloon. As a result, one grows and matures in wisdom, intelligence, compassion, and relationships, in addition to skills, and does so one breath at a time. Becoming familiar with these well-documented stages of growth is an important window into the worldviews and beliefs of individuals and how those views shape your organization. Promoting developmental change and understanding how transformation occurs can shatter a hidden glass ceiling that could be stunting the growth of people in your organization who are constrained by current organizational limitations. Embed goals in ethical principles that you will not sidestep. Goals are useful targets, but they do not inherently have virtuous results. Part of success is being able to be adaptable with any goal or target as new landscapes come into view. Adapting goals quickly to changing conditions can inhibit unintentional negative side effects in an attempt to keep them alive and operable without adapting. Developing a set of principles that guide your adaptations can keep your revisions within ethical boundaries and enhance the kinds of results you want to achieve in the world. For example, if your principle is transparency, you would know right away if you were hesitant to be forthright about an alteration of a process in action, and upon examination you might discover unconscious underlying reasons for your hesitation in being transparent. Whatever the principles are, they can mold and shape goals and dictate how they are reached as they adapt to changing contexts. By deciding up front a set of principles you will not go outside of, you can quickly make decisions about any variations in your aims and be less apt to cause unintentional harm to others, to society, as well as to the bottom line. Experiment with small changes and then try them on yourself. A strategist (level five) leader can stand back and see the systems s/he is working with as well as the organizational environment. This kind of leader can evaluate where the weak links are in the whole of the system and strengthen those places, often in collaboration with others. If the adaptation works you will see positive change in those who work in the organization, and one way you can know that your change is appropriate is if it grows you as well as others. You can experience this by stepping back into the system you have adapted and notice how you experience the change as it applies to you personally and through that lens, how it applies to others. Work with individual and collective shadow issues. This is one of the most challenging parts of being a strategist (level five) leader as tested by STAGES. At strategist (level five), people are willing to take personal risks in updating their perception and behaviors, and in addressing organizational inconsistencies. The obvious one at this level is seeing your own projections (getting frustrated by others who have qualities you don’t recognize or acknowledge in yourself). You will know if you are projecting if you catch yourself judging someone or assuming something about someone, and after you reflect at the end of the day on these judgments and assumptions, you may begin to see patterns of behavior in yourself that bother you in others. It helps to write them down and provides you with a tool to evaluate that which you judged in others, in yourself. The truth is that none of us can’t judge what is in others unless we have that experience also somewhere inside ourselves. For a simple example, when you are driving and someone cuts you off, you may find yourself extremely angry. If you can see your projection, you might ask yourself “Have I ever cut someone off in traffic?” Projecting our judgments is common and we are usually unconscious that we also own the same qualities we find annoying in others. Identifying projections is very important because in organizations we may be finding fault with others for things we, ourselves, are doing. By identifying the projection, we are able to address our own disruptive behavior and change the relationship with others. After we have addressed our own behavior, we can invite others to do the same. 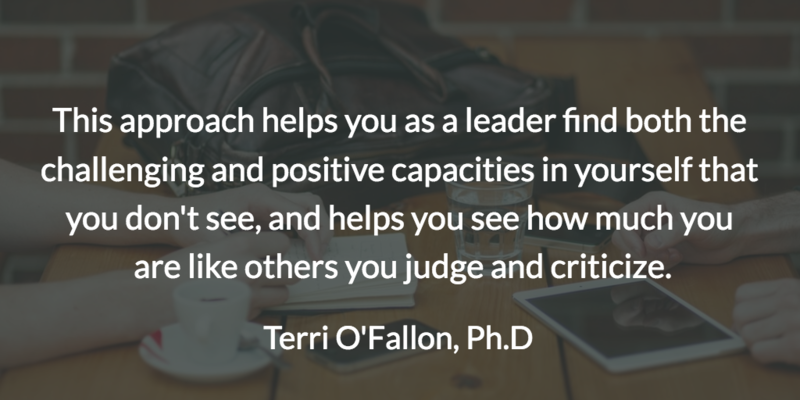 This approach helps you as a leader find both the challenging and positive capacities in yourself that you don’t see, and helps you see how much you are like others you judge or criticize. This understanding alone can help to build resolution in tense situations that inevitably arise. These projections permeate most groups or organizations (collectives) . There will frequently be times when there are self-righteous and indignant accusations among people working together, between departments, and between organizations. Over time, unconscious collective agreements become organizational habits that can inhibit creativity and honesty and lead to ineffectiveness. Collective examination and identification of these unconscious, and often limiting, habits can improve effectiveness and benefit the whole of the organization and, potentially, innovation. These kinds of projections are like putting a rubber band around a tree and then around your waist. You can stretch that rubber band only so far and it will eventually halt or slow progress—or worse, simply snap and throw you back. 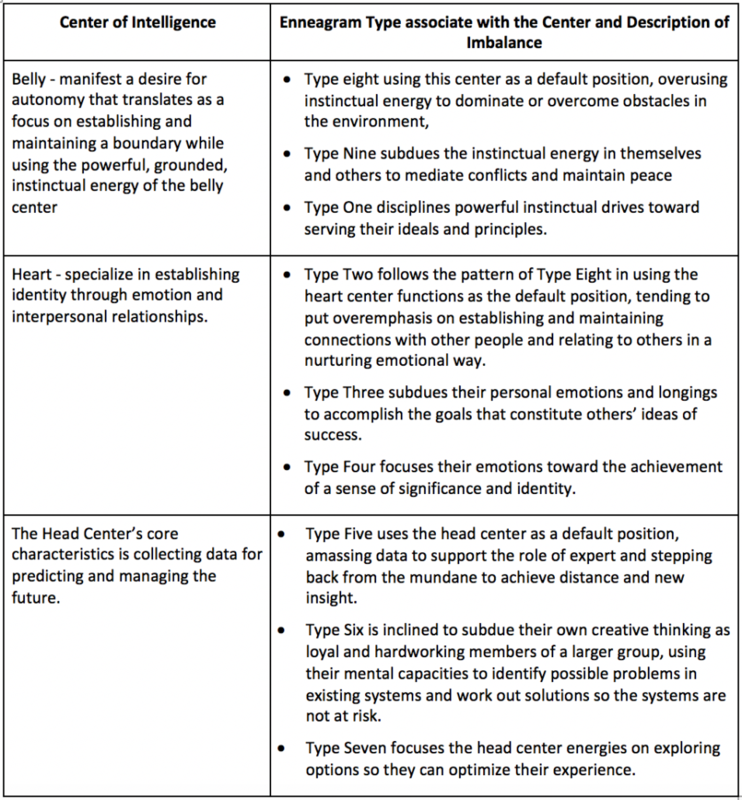 We use the STAGES matrix to identify these hidden areas, to find the specific areas that need attention, and to create interventions that are effectively and efficiently targeted for healthy adaptive change. Terri O’Fallon, PhD has focused the last 23 years as an applied researcher, Terri O’Fallon’s focus over two decades has been on “Learning and change in Human Systems”. She has worked with hundreds of leaders studying interventions that most result in developing leaders who can effectively implement change. She has a PhD in Integral Studies from the California Institute of Integral Studies. Terri is, also, the cofounder of two organizations. She and Kim Barta have created Developmental Life Design, an organization that focuses on how the STAGES (developmental) model can support insight into our own growth as people, leaders, guides, and coaches, and how the impact these insights have on our influence in human collectives. She also partners with Geoff Fitch and Pacific Integral using the STAGES model to develop experiments in collective insight and developmental growth. 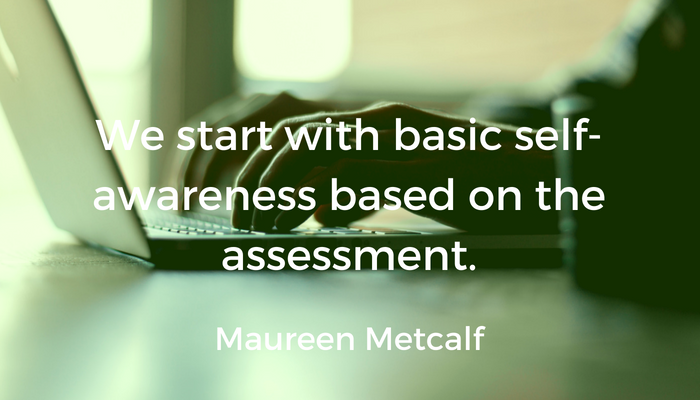 Today’s post is a collaboration between Beena Sharma and Susanne Cook-Greuter, Co-founders of the Center for Leadership Maturity with Maureen Metcalf. This post is a companion to the Voice America Interview between Maureen and Beena on September 22, 2015. Your level of Leadership Maturity significantly influences your capacity to deal with life and work situations, how you see your role and function in the workplace, how you interact with other people, how you solve problems and how self-aware you are. Leaders develop through various stages of maturity as they grow. Leadership Maturity is about how leaders ‘make meaning’ or sense and interpret experiences at the different stages of development. This is important because the perspectives you use to make sense of the world influences your thoughts and actions. Incorporating the idea of the various stages of your own Maturity is critical to innovating your leadership. The author Jim Collins referred to Level 5 Leadership in his best-selling business book, Good to Great. Level 5 Leadership is an example of later stage leadership maturity described in the innovative leadership framework. One application of using the stages of maturity model is to appreciate ‘fit for role’ in organizations. For example, at the ‘Specialist’ level, a leader may perform a process task well and be procedural. A later stage leader (at the Relative level) who is more mature, would be better at handling more complex situations, including those situations not generally addressed by the rules, and would be better able to take into account the context of the task and adapt when needed. Another application of this framework is to create a development plan for leaders that is well suited to the level of development they are at, and what would be next for them in their path to maturity. It is important to note that all stages of maturity bring their strengths and wisdom to an organization, and an optimum mix of levels makes an organization more effective and successful. Identifying high-potential leaders to groom for growth opportunities. Determining individual fit for a specific job or role in the recruitment and succession process. Supporting change agents in understand the perspectives and capacities of others at different stages and tailoring solutions that meet the needs and perspectives of all stakeholders. 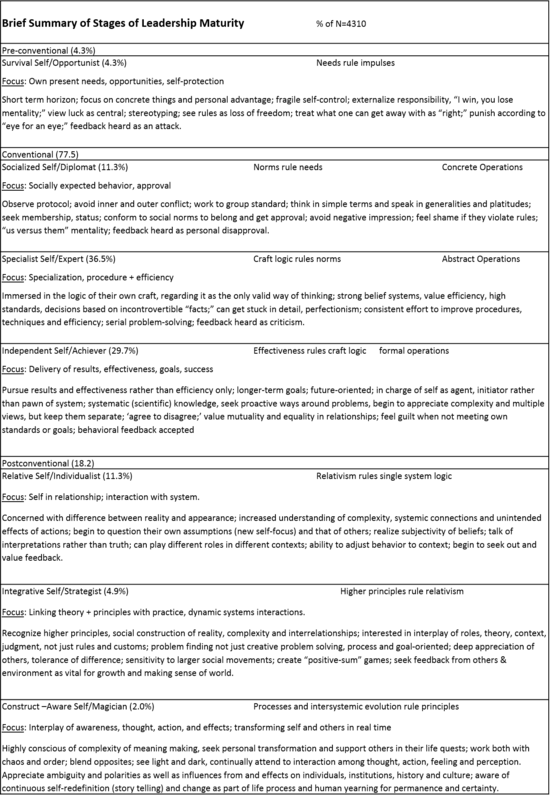 Metcalf & Associates uses the Maturity Assessment Profile (MAP) and its conceptual framework, the Leadership Maturity Framework (LMF) in assessing Leadership Maturity. This was researched and validated (with criteria at later stages of development) by Susanne Cook-Greuter as part of her doctoral dissertation at Harvard University. This instrument is the most rigorously developed, Harvard-tested, unbiased and reliable perspective measure on the market globally today. 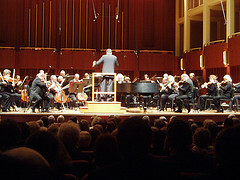 The MAP provides unique and personal feedback in addition to stage description and score. The MAP is also the most sophisticated instrument for identifying and measuring later stage, developmentally advanced leadership. The MAP evaluates three primary dimensions to determine developmental perspective: cognitive complexity, emotional capacity and behavior. The following table briefly summarizes the levels, and the percentage of the sample population at each level using a sample size of 4,310 people. The name of each stage also indicates the old name (previously used terms) in parenthesis. The Center for Leadership Maturity continues to evolve this model and the development tools for its application. The new name change is evidence of this evolution. Specifically, it is important to note that while we refer to people being “at a level”, people actually demonstrate perspectives across a range of levels, while evidencing a ‘center of gravity’ at the stage that they generally tend to operate from. As you listen to the interview, and as you read the descriptions of the various stages that follow, we encourage you to reflect: what level seems to you closest to how you operate? How does that level fit with your job requirements and professional context? What range do you test across? How does your score map to your current job requirements? What additional perspectives might you want to develop if you aspire to Learn and grow into the next role in your career? Leadership 2050 – What Qualities Will We Need? This blog post includes excerpts from chapter 13 or an upcoming book edited by the International Leadership Association: Building Bridges series in June 2015. The chapter was written by Susan Cannon, Maureen Metcalf and Mike Morrow-Fox to explore the question of what does leadership look like in 2050. The qualities of effective leadership can be paradoxical—requiring effective leaders to be passionate and unbiased, detailed and strategic, hard driving and sustainable, fact-focused and intuitive, self-confident and selfless—often at the same time. Such complexity is rarely found in leaders even under optimal conditions. As we move toward 2050, new contexts and conditions are poised to emerge that will create challenges beyond the abilities of most leaders or any single nation to manage. This powerful contextual shift—a time of great stress and constraint—has the potential to drive a new and more complex stage of human culture and consciousness to meet these challenges. This perfect storm of increasing complexity, accelerating change, and near constant uncertainty is creating conditions that exceed the mental and emotional capacities of most leaders. While technology is advancing exponentially, our laws, culture, and social contracts are moving in a linear fashion. 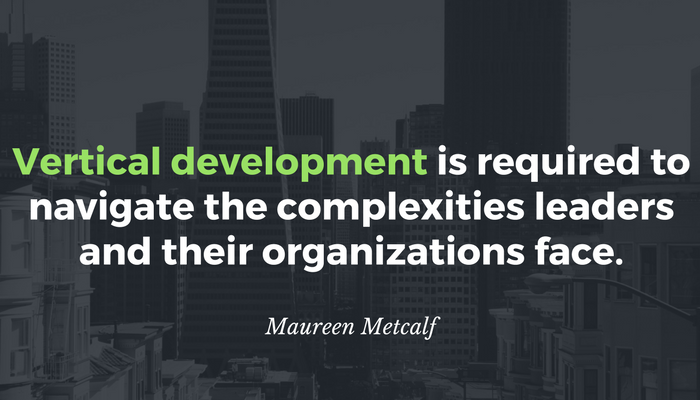 The same is true for conventional approaches to leadership development. Four recent global studies on the future needs and gaps of organizational leadership concluded that current leadership lacks the higher-ordered skills and capacities to meet the complexity of even today’s challenges. For example, current leaders lack the ability to function in environments that have a high degree of ambiguity and uncertainty, to build cross-cultural strategic relationships, to facilitate collaboration between diverse groups, or to sense the crucial and unspoken undercurrents and relational dynamics in a meeting. The systematic cultivation of such higher-ordered capacities in leaders requires more than training—it means they must psychologically evolve to a more complex way of being. The stages of a leader’s growth have a direct correlation, and thereby a natural fit, with stages of cultural evolution. The new leader that emerged with each cultural stage had the requisite capacities and developmental maturity to reach beyond what came before. For example, someone seeking to become a term-limited chief executive of a Modern era nation-state democracy must have the more complex, nuanced, and emotionally intelligent capacity to gather support and communicate with the electorate and representatives in a way that a Traditional era bloodline monarch, ruling by fiat, would not need or understand. This emerging cultural stage of development structurally correlates to the Strategist leader. Perceives systematic patterns and long term trends with uncanny clarity. Can easily differentiate objective versus subjectively biased events. Exhibits a strong focus on self-development, self-actualization, and authenticity. Pursues actualizing personal convictions according to internal standards. 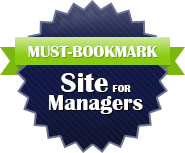 Management style is tenacious and yet humble. Understands the importance of mutual interdependence with others. Well-advanced time horizon: approximately fifteen – twenty years with concern for legacy. In future posts we will explore how to recognize Strategist leaders so you can hire them and/or position them in strategic roles within the organization. We will also talk about how to develop them. 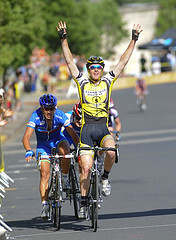 Cook-Greuter, S. (2000). 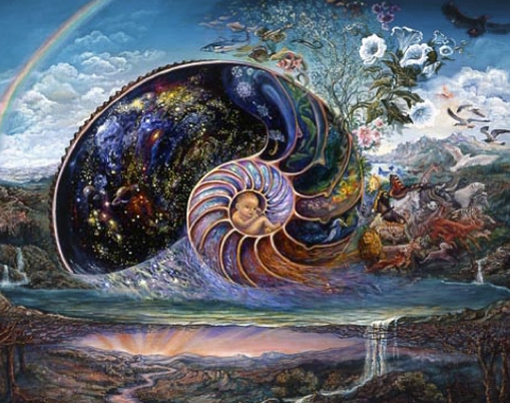 Mature ego development: A gateway to ego transcendence? Journal of Adult Development, 7(4), 227-240.
https://www.innovativeleadershipinstitute.com/wp-content/uploads/2015/03/Paradox-cc-Hartwig-HKD.jpg 875 1187 Maureen Metcalf https://www.innovativeleadershipinstitute.com/wp-content/uploads/2018/10/logo.png Maureen Metcalf2015-03-09 08:30:142015-05-28 23:19:53Leadership 2050 - What Qualities Will We Need? This blog seven part blog series talks about Leadership 2050 and the leadership mindset necessary for success in the future. We walk through what the future of leadership will look like then walk you through the story of Jill as she moves through the developmental perspectives. Growth through the perspectives is a linear process in that we progress through each step without skipping stages. In the post last week we saw Jill growing through the Individualist Developmental Perspective. We now see Jill break into a very pivotal stage of the developmental path: the Strategist. Strategist thinking is effective at balancing all critical areas of decision-making. At this stage, leaders are capable of balancing both short and long-term decisions, maintaining the needs of multiple stakeholders, and effectively weighing the need for structure while remaining flexible and responsive. The strategist is capable of giving clear direction as well as responding to the ongoing stream of new information and the inevitable disruptions to plans. The strategist instills confidence in others while acknowledging their own personal limitations. Let’s continue with Jill’s story of expanding growth. At age 42, Jill has joined a global consulting firm as a Partner. 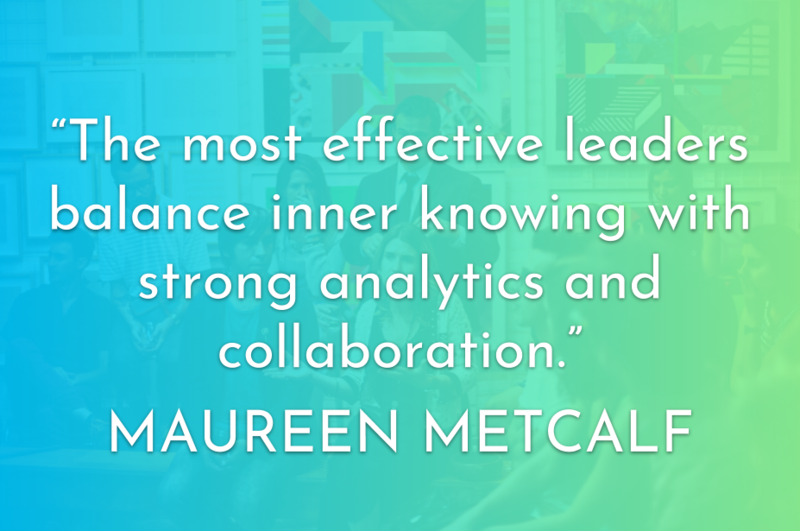 On a daily basis she is involved in helping leaders and their organizations become more effective and sustainable. Jill and Matthew sold their large house and invested in a modest home with great sun for Jill’s garden. They retrofit the house with a gourmet kitchen so that friends can join them for meals cooked with fresh local food. Jill often works from home which fits her lifestyle that now values balance. She works with others who have similar values who also appreciate the flexibility she provides them. Randy comes by often and is her mentor and friend. Jill feels a meaningful commitment to her life as she dedicates herself to improving organizational effectiveness of her clients. She also works to create jobs paying fair wages and having a positive impact on the community and the world. She has moved from working as a volunteer to be the Board Treasurer of the nearby nature preserve. She leads the nature preserve to expand their mission to include children’s wilderness experiences and creating a community garden. She believes that her volunteer time should have as much impact as possible and board work allows her to meet an organizational need that is not otherwise available to her. When Jill thinks about her marriage, she is grateful that she and Matthew decided to work through their relationship challenges. She recognizes that while the counseling and personal changes were difficult, he has played a critical role in her life and she still loves him for his willingness to support her during her transition. She is excited to see Matthew make several changes in how he sees himself in the world as a result of their counseling such as his willingness to simplify their living arrangements and move to a much smaller home. At this stage, Jill has learned to value her own thought processes and time alone enough that twice a year she deliberately spends one week at a cabin in a nearby state park with her Journal. Matthew joins her in this experience during which he hikes and reads. During this time, Jill evaluates what she is doing with her life and what needs to change. She thinks about her different strengths and contemplates if she is overusing any, as she did when she was younger. She appreciates the many opportunities afforded to her to be logical, analytical, creative, strategic, and tactical. Jill’s perspective is moving toward thinking about the global implications of issues. She finds that she is now considering how systems fit together and she wants to reach out to connect her organization to others in other countries to make the best use of global resources. She is now representing the United States at the World Economic Forum. She is strengthening her network of connections and is eventually offered a role with a global organization. The opportunity comes from an initiative emerging from the World Economic Forum. Her ability to think in a twenty-year time horizon as well as her cultural sensitivity makes her effective in this new role. She begins working closely with the Gates Foundation and other prestigious groups and finds her organization is making a significant impact in areas that are important to environmental sustainability and global peace. Jill continues to meditate, run, eat in a healthy manner, and do yoga. She has found that taking care of her body, mind and spirit allows her to function effectively in very stressful situations. Her meditation has worked to strengthen her focus so she is not pulled off track nearly as much by challenges that come up on a daily basis. Additionally, exercising helps her burn off the frustration of the day and she feels refreshed and calm as well as sensing an increase in her stamina. In summarizing the Strategist perspective, it is important to note that leaders at earlier developmental perspectives can be very effective. The Strategist perspective becomes most important when leading large complex organizations or activities. It is not necessary for a CEO to be solidly grounded in the Strategist perspective if he or she has an advisor who is. Often a CEO role attracts leaders who demonstrate the Achiever perspective while others who have different life goals may fill roles that are less visible in a trade-off that may allow for a greater balance in life. In the post last week we saw Jill growing through the Achiever Developmental Perspective. This week we will see her move to the Individualist Perspective as she becomes more complex in her thinking and her time horizon expands. This is the fourth of the five perspectives that we see most often in professional settings.. Our intent is to illustrate how a leader progresses through the developmental perspectives and how they “fit” in jobs aligned with their developmental perspective. At 37, Jill was out-of-work and disoriented. She had spent fifteen years with the firm that summarily cut her out. She spent the first few weeks after losing her job feeling a bit lost; she was at home all day with no immediate agenda other than figuring out what she wanted to do next. This was a question she never imagined she would be asking herself. Matthew was working even more than his usual 60 hours to attempt to ensure he did not meet a similar fate. Jill was fortunate that her firm offered outplacement services. Her counselor helped her begin to explore what she wanted in the next phase of her career. In addition to considering her career, Jill started thinking about what this would mean for her life. She picked up her journal and wrote her thoughts about her motivations and choices. She started thinking about the roles she had made for herself: daughter, employee, boss, and wife. As the months went by, Jill withdrew somewhat from her social life and became more introspective, trying to make peace with what had suddenly happened. However, filling a need to get up and move, she decided to start taking yoga classes. She recalled wanting to do yoga before but had never found the time. So, she started in and connected with a new group of people. The individuals in her yoga class were different from her other friends and she enjoyed learning more about them and their perspectives. Jill talked quite a bit with another man in the class, Randy. He was also a business professional so there were similar backgrounds. Randy was laid off several years ago so Jill was able to relate to him. Randy found another job that provided him much greater satisfaction than the one he had left and was able to provide a sounding board to Jill as she evaluated her life. Jill started to deeply value the opinions of those around her, particularly when they differed from her own. This seemed new to her as she didn’t recall input and feedback being so critically important to her before. She was experiencing many things differently as she stretched her mind. She was less focused on her five-year plan and more on what was happening in the moment. 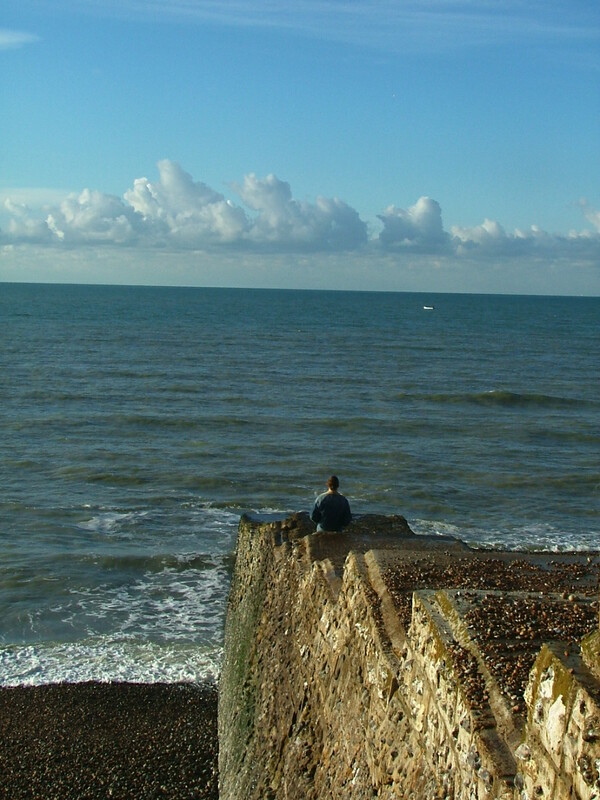 Jill started meditating to help maintain a sense of calm and focus. She found that meditation helped keep her mind from wandering and away from her ongoing questioning of what she had done wrong to lose her job. In conversations with Randy, Jill talked about the different parts of herself and the different roles she played in life. She saw how the different roles had taken over at various points in her life. Specifically, how she had weighted the logical, analytical side so heavily during her career that she had lost the part of her that loved sports and reading books. She talked with Randy and wrote in her Journal about how to rediscover these different aspects of her personality in a meaningful way. Jill reached out to her family and spent a couple weeks with her parents asking questions about their beliefs and choices. She was amazed to hear their stories about her childhood; she learned things about herself and her parents that she hadn’t realized before. For example, as a small girl, she had loved to play in the woods and watch her dad cook. Her family had traveled around the country camping in National Parks. As a child, she had developed a deep love and reverence for the natural world but had forgotten these passions as her focus shifted during her life. In an attempt to reconnect with the passions she had as a younger person, she helped her dad in the kitchen during her visit and was surprised how much she enjoyed slowing down and delving into the different ingredients. It was a sensory, tactical experience that she had devalued during her career when she was focused on all things logical and analytical. She decided to plant a garden in her yard to grow some of her own food. This placed her outdoors allowing her to reconnect with her love of the natural world and with food. During her time between jobs, Jill began taking time to enjoy being outside. Initially she went to local parks to hike and journal. She began to remember the joy she felt when she was alone in the woods. Over time she started going to a retreat center in the woods where she spent days with her journal and books. She was away from her computer and cell phone for the first time in over fifteen years. She and her dog, Yoda, took long hikes often. Over a period of months, she began to feel more connected to what it seems she had lost during the years of long hours of work and graduate school. She began to have a sense of peace in her life. As she re-evaluated her perspectives, Jill was becoming more environmentally conscious and beginning to think about and question long-term organizational sustainability. Living in the state capital, she had ample opportunity to join groups focused on sustainability. Her interest in environmental sustainability expanded and she began volunteering her time at a nature preserve. During this time period, Jill’s relationship with Matthew became rocky as he was unable to relate to what Jill was going through. She spent time thinking about why she got married and what Matthew brought to her life. After much thought and frustrated discussion with Matthew about what she was doing with her life, they sought counseling to work out their differences. While they had drifted apart, they were dedicated to each other and recommitted to one another during this process. Both Jill and Matthew agreed to make changes in their relationship including discovering common activities and making time for one another. During the rekindling of their relationship, Jill began to feel the support she needed to explore options other than returning to accounting. Jill began looking at new career opportunities. She wanted to find work where she could feel satisfied and make a difference in the world. Also, she wanted to work for an organization that was socially responsible. Exploring the worlds of yoga, hiking and environmentalism were wonderfully satisfying to her but none of them would provide the paycheck she needed to survive. Jill began exploring what she needed to live. She considered downsizing her house, if Matthew would support this choice. She did not want to return to a job that would require her to work so much. She wanted more balance. Her growing awareness of the world around her changed the meaning of things and they became just that: things. She felt weighed down by all she had accumulated and wanted to simplify. Jill’s trip to her parents stayed with her and she developed an enduring and unexpected interest in food and nature. She began trying out recipes and exploring cooking the foods she grew in her garden. She also augmented her diet with food from a local farmer’s market. She started buying organic food and cooking healthy meals. She would often invite her new friends over to taste her food. She felt a sense of joy in having another way to connect with friends beyond the fancy restaurants and trendy bars they had hung out in during her years with the accounting firm. As Jill explored her professional options, she began looking at different ways to combine her professional skills with her passion to make a difference in the world. She decided to take a job as the Director of Finance with a national medical supply company that was socially responsible. This job allowed her to use her financial and leadership skills and also work for a company that impacted society in a positive manner through their socially responsible initiatives as well as their focus on minimizing their environmental footprint. Additionally, she began teaching cooking classes in an adult learning program and she became involved in the slow food movement. She continued to have friends over to experiment with new recipes that she would share with her adult students. People who exhibit the Individualist perspective demonstrate a much higher level of self-awareness, self-regulation, social-awareness, and relational ability than those at earlier perspectives. They are more likely to think “outside of the box” and often will try to redefine or make sense of “the box” in terms of their own personal experience. Because they are less constrained by conventional thinking, they often develop more creative or innovative solutions to challenges. As you think about how different levels interact, consider the unique perspective of each level, such as how the Individualist is interested and focused on being out of the box while the Expert needs to use the box to help define the right terms of success. Thus, if an Individualist leader supervises Expert employees, successful outcomes will hinge upon the clear definition of tasks. Increased capacity for advanced complex thinking. Exhibits an ability to appreciate paradox in circumstances. Begins to value and use rudimentary aspects of intuition. Beginning awareness that perception shapes reality, including their own. Self-reflective and investigative of their own personalized assumptions, as well as others. Understands mutual interdependence with others. Lives personal convictions according to internal standards. Style is tenacious and humble. Longer time horizon: five–ten years. In this post we saw Jill as she grew into the Individualist Developmental Perspective. Next week we will see her move into the Strategist perspective. We believe that Strategist is the perspective needed for leaders to navigate large complex change. In the post last week we saw Jill as she grew through the Expert Developmental Perspective. This week we will see her move to the Achiever Perspective as she becomes more complex in her thinking and her time horizon expands. This is the third of the five perspectives that we see most often in professional settings.. Our intent is to illustrate how a leader progresses through the developmental perspectives and how they “fit” in jobs aligned with their developmental perspective. At twenty-five-years old, Jill was working at the nationally known accounting firm. Her altered behavior made her more popular although she still didn’t really understand why. However, with her popularity came more invitations to join her co-workers for dinner and drinks. As she spent more time with her colleagues, she started to become aware that her style was not consistent with others. She hired an image consultant to help her appear more professional as this would help advance her career. The restaurants and bars frequented by the group were often filled with designer clothes and adjacent to a parking lot of BMWs and Acuras. Jill started thinking about what she wanted out of life and developed a five-year plan. This plan included her goals in several areas of life including: career, house and car, marriage and family, and savings. For the first time since she was a little girl, Jill started a journal and wrote about her life experience. She appreciated seeing the changes in herself. She started reading biographies as a way to evaluating how other people’s choices helped bring about the lives they enjoyed. Jill decided that she would like to return to school to earn an MBA; she noticed that many of the senior executives in her company had advanced degrees. Returning to school and getting promoted were two of the key goals in Jill’s five-year plan. Once Jill returned to graduate school, it seemed all of her time was spent working or studying. Her reviews improved as she started managing her time to better accomplish her five-year plan. Her task list for each day got a little longer until she was working 60 hours a week minimum; her boss noticed this and Jill was promoted to the next level. The substantial pay increase allowed Jill to buy a house for herself and a garage for her new Audi TT. She was excited about these purchases but had little time to appreciate them. Most of her energy continued to be dedicated to work and school. Jill often attended training events to learn about the latest GAAP or FASB pronouncements. At one of these events, she met Matthew, an accountant at another firm. As they talked, they found they both value responsibility, family and community. Their courtship was slow as they each worked significant hours but they found time to meet once a week. Jill was delighted as getting engaged was on her five-year plan and Matthew appeared to be just the right fit for her. After a few years of dating, Matthew proposed. Jill happily accepted and they set a date for another year down the road. Jill’s hours at work reduced just a bit as she planned the wedding but she was still effective enough to receive another promotion. At 31, she was making more money than she thought she ever would and was about to marry a wonderful man. Jill didn’t think that life could get much better. The wedding went off without a hitch and Jill sold her house to move into Matthew’s place as it was quite a bit bigger than hers. They settled happily into married life with both of their careers going strong. About five years went by and Jill was still quite happy with her marriage and career. However, the firm she dedicated her entire professional career and much of her life to was experiencing significant financial trouble. Unexpectedly, they laid off her whole department. Suddenly, Jill became unemployed. She was in a state of shock and confusion immediately after the layoff. People at the Achiever perspective are primarily concerned with accomplishing and completing tasks. Their focus has moved away from the mere perfection of each task and toward achieving as much as possible. The Achiever’s primary focus tends to be heavily aimed at delivering the desired results. These could be installing a computer system, delivering financial returns to stockholders, exceeding sales goals or raising money for charity. They are often very successful and resourceful, especially if there are clearly presented goals and measurable objectives to achieve. Basic ability to identify shades of gray and see conceptual complexity. Focuses on causes, achievement, and effectiveness. Considers others while pursuing their own individual agendas and ideas. Sees themselves as part of the larger group, yet separate and responsible for their own choices. Appreciates mutual expression of differences. As one becomes a highly effective Achiever, further growth may move into the next developmental stage, Individualist. We will follow Jill next week as she moves to the next level. 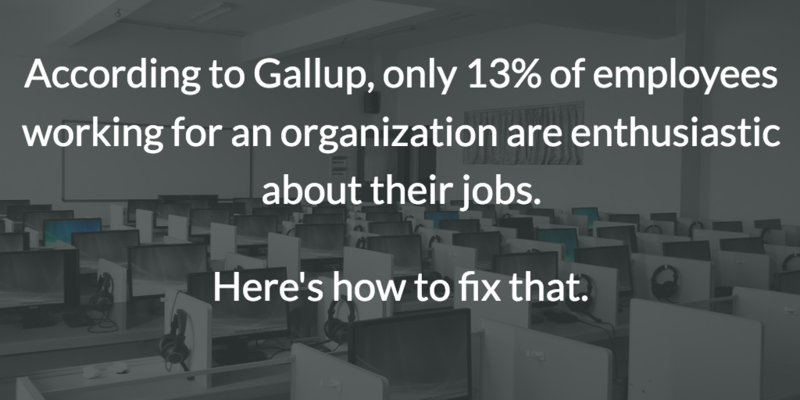 This perspective tends to be much less common among most typical organizations.